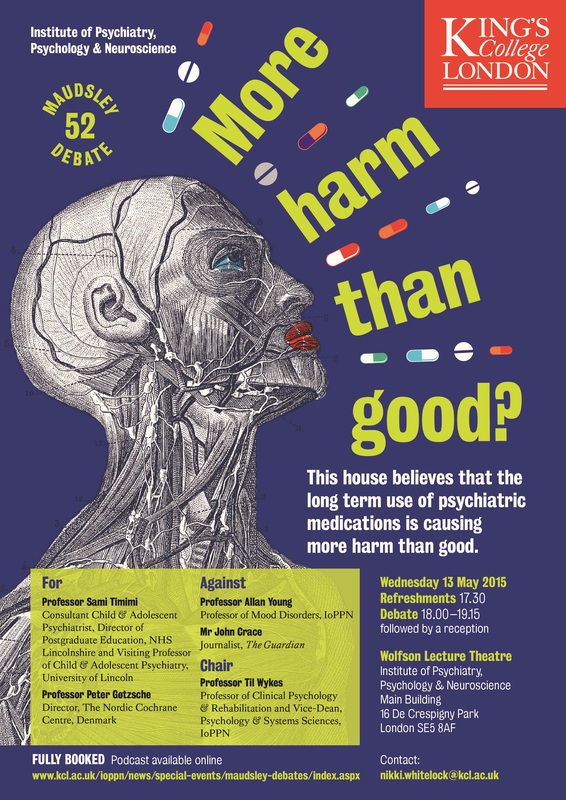 Some people have wondered why the Cochrane leadership tried to denigrate my research about the harms of psychiatric drugs in relation to the Maudsley debate , which took place in London on 13 May 2015. 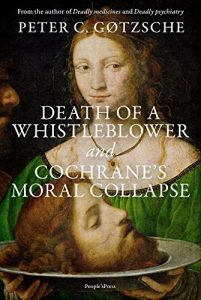 I wasn’t given the opportunity to comment on the Cochrane leadership’s reply to the Danish psychiatrists, although I, in my capacity of being the director of the Nordic Cochrane Centre, represents Cochrane in Denmark. If I had seen the letter, I would have pointed out that it was dynamite that would explode in any journalist’s hands, which was exactly what happened (see my book, “Deadly Psychiatry and Organised Denial” for details). It came as no surprise to me that Danish journalists interpreted this letter as meaning that I had now come under Cochrane censorship and wouldn’t be allowed to publish anything unless it had been approved by Cochrane. This was bizarre and was of course not the intention with the letter. The letter from Cochrane’s leadership was a threat to what I had built up over 30 years, including my centre, which is on government funding, and the newspaper that broke the story seriously misrepresented the letter. 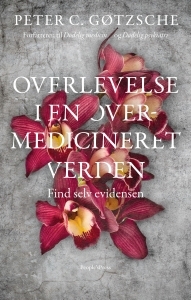 For example it wrote that, “the organisation doesn’t agree either with the views Peter Gøtzsche describes in his book where he compares the business model of the drug companies with criminal organizations.” This was free fantasy, and I didn’t present views in my book, I presented facts. 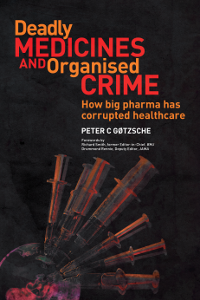 An organisation like Cochrane is not entitled to disagree with facts like the fact that Pfizer, the world’s biggest drug company, has been convicted of organised crime and a conspiracy. Cochrane cherishes openness, free debate and transparency. I feel it is in line with our core values that I now inform patients, their relatives and others about some bizarre events related to the Maudsley debate they would otherwise not have known about. 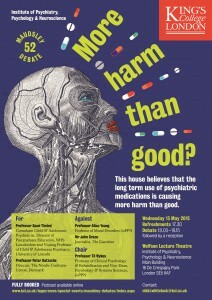 The two sides of the debate published a joint paper in the BMJ. The BMJ issued a press release on 9 May where our paper could be downloaded, which I did. This was the original version, but it quickly disappeared. I sent the press release and the original version of the BMJ paper as a courtesy on 9 May to the editor-in-chief and deputy CEO of Cochrane, David Tovey, and to the editors of the Cochrane mental health groups. To my great surprise, Tovey and three of these editors published a rapid response to my paper on 12 May, the day before the Maudsley debate, where they tried to denigrate my research and position at the debate, which is that long term use of psychiatric medications is causing more harm than good. This response was originally dated 12 May but if downloaded today, the date is 13 May, the day of the Maudsley debate, which is a curious and unexplained change of date. As might have been expected, Allan Young abused the Cochrane editors’ rapid response in his final remarks during the debate (see video here) to which I was not allowed to respond. Young claimed that my BMJ paper had been rebutted by the Cochrane editors, which was certainly not the case, and could not be the case, as my position is solidly based on good scientific evidence while the Cochrane editors’ rapid response was evidence-free and opinion based, which I explained in my reply. 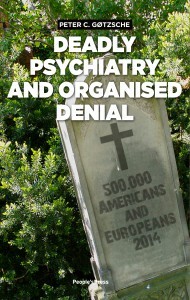 I explained in a letter to David Tovey, Mark Wilson, and Julie Wood, Head of External Affairs and Communications, Cochrane Central Executive, the damage the editors had caused with their rapid response, which some people interpreted as an attempt at protecting psychiatry’s guild interests rather than protecting the patients whose views on psychiatric drug are in sharp contrast to the views of the psychiatrists but in close agreement with the science, as I explain both in my rapid reponse and in my psychiatry book. I had not intended to make my letter public, but because of the public interest in this affair, and considering the core Cochrane values, and the many curious events, I felt it was the right thing to do to put things out in the open for the public – Cochrane’s primary constituency. People who are interested in this bizarre story or in psychiatry in general might wish to follow the subsequent debate on BMJ’s website. A comment posted by Robert Whitaker and Lisa Cosgrove is particularly revealing.